At its more than 530 sites in 74 countries worldwide, Brenntag is present as an employer, a business partner and a neighbour in local communities in many different countries and cities. We see ourselves as part of these communities, as a “corporate citizen”, and we maintain a lively dialogue with them and aim to contribute to a positive environment. Brenntag’s social commitment is driven primarily by our employees. They collect money and donations in kind and invest their expertise, their time and their manpower in support of charitable causes. In many cases, Brenntag supports their contribution either financially and organizationally or else by releasing them from their work duties. The promotion of education is a focus of Brenntag’s activities in all of its regions. A large number of our sites have been cooperating with schools, universities and institutions for many years now with the common aim of encouraging young people’s interest in chemistry and our industry, sensitizing them regarding the handling of chemicals and supporting their education. Brenntag aims to provide assistance exactly where it is needed. Because local needs vary from country to country due to national, cultural and structural differences, the Brenntag sites decide autonomously where and to what extent they get involved in social initiatives. Unfortunately, numerous Brenntag sites, employees and neighbouring communities in various countries were affected by serious natural disasters in 2017. Our employees here made tremendous efforts both individually and in teams by providing rapid and non- bureaucratic aid to the people affected by means of monetary donations and donations in kind. Brenntag also helped by offering additional financial assistance as well as materials to secure houses. In September/October, a succession of severe hurricanes and storms left major devastation and damage in their wake in numerous Central American countries and regions of the US. Brenntag set up relief funds here to raise money for the employees affected and topped up the donations. For example, employees of Brenntag Northeast in Reading, Pennsylvania, collected an impressive 15 tonnes of material donations for families that lost all their possessions and raised money to purchase additional aid supplies. In Bangladesh, our employees donated money to buy food for the victims of the devastating floods that ravaged large parts of the country during the year. At the start of November 2017, Brenntag employees in Malaysia collected material donations such as clothing, sanitary products and medicine for the people affected by flooding in the state of Penang. A close dialogue with local emergency forces and mutual aid agreements are typical of many Brenntag sites around the world. In North America and Latin America, for instance, we provide local fire brigades as well as police and emergency services with financial support and equipment and make available to them our expertise and our sites for seminars and joint rescue exercises. The experience gained by Brenntag here has made the company an ideal partner to organize the Dominican Republic’s first competition for company fire brigades together with the country’s ministry of Labor in 2017. As part of this nationwide event, Brenntag Caribbean was able to pass on its expertise to over 60 participating companies. In 2015, Brenntag UK & Ireland launched “Brenntag Giving”, a distinguished program developed and managed entirely by its employees. As a reward for the charitable commitment of its already extremely active employees and a further incentive to engage in more community projects, every month under this initiative Brenntag provides a fixed amount as a further support for a site whose employees demonstrate a particularly strong level of commitment. This site is then free to decide which good cause or registered charity will benefit from this additional financial contribution. Brenntag also allows its employees to take a day off work so that they can support a charitable organization of their choice. In May 2016, Brenntag’s efforts in this arena were recognized by the chemical distribution industry peers, as the British Chemical Business Association honored the program with its “Community Interaction Award”. Learn more about Brenntag Giving. The “You Be The Chemist Challenge”® (YBTC) is an interactive science competition in the USA which encourages 5th – 8thgrade students to take an interest in chemistry and its applications in everyday life. For nearly ten years, Brenntag North America and its employees have sponsored and supported this program, which was initiated by the Chemical Education Foundation in 2004. This question-and-answer competition begins at a local level in almost 40 federal states in the USA. The top students from each state then face one another in a national final. By participating, children not only improve their knowledge of chemistry, but also develop their learning, communication and time management skills and boost their self-confidence in a playful competitive environment. Brenntag’s commitment to YBTC goes way beyond financial support. Every year, our employees recruit new schools to participate in the program. We help the children to prepare for the competition through special study guides and chemistry sets for experiments and by visiting schools. At the events at local and state level, Brenntag employees take care of the organizational and catering arrangements, act as hosts and jurors and support the children as they progress through the competition. They therefore develop a strong bond with the young participants on their path together and share in the thrill of every decision. Learn more about the "You Be The Chemist Challenge"<sup>®</sup>. The promotion of education is a focus of Brenntag’s activities in all of its regions. A large number of our sites have been cooperating with schools, universities and institutions for many years now with the common aim of encouraging young people’s interest in chemistry and our industry. In Germany, Brenntag GmbH presents the “Brenntag Award”, which includes prize money, twice a year to the top graduate of the ”Business Chemistry” course at Heinrich Heine University in Düsseldorf. In Latin America, many Brenntag sites regularly support the communities in their immediate vicinity: In Costa Rica, Brenntag donated and installed a rainwater collector to a school, while in Guatemala, water purifiers were provided to families in need – the money for these was raised from the recycling of materials at the site. In the Dominican Republic, Brenntag Caribe sponsors a small park in front of the Herrera site, which is maintained together with the local community and used for communal and joint activities. Brenntag North America has closely cooperated with the non-profit organization “Habitat for Humanity” for many years now: through monetary donations and in giving their time, Brenntag employees help to build secure and affordable housing for the needy and low income families in local areas. Brenntag pursues lively dialogue with local residents and local authorities. Open days or similar events provide the opportunity to inform the general public about Brenntag and to get to know one another. A good example is the “Long Night of Industry” in October 2015, an event Brenntag’s German location in Duisburg participated in. 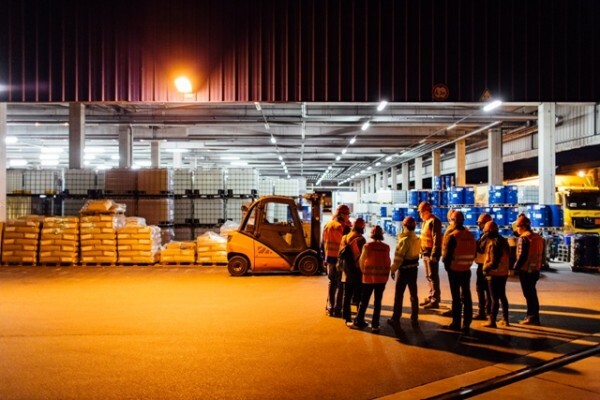 According to the motto “World market leader in your neighborhood”, the Brenntag employees led 80 guests through the modern site which is one of Brenntag’s biggest locations worldwide with around 60,000 square meters. In particular impressive was the high-rack storage with its height of 40 meters and capacity of around 10,000 pallets. Many visitors were surprised to learn about the varied tasks of a chemical distributor.